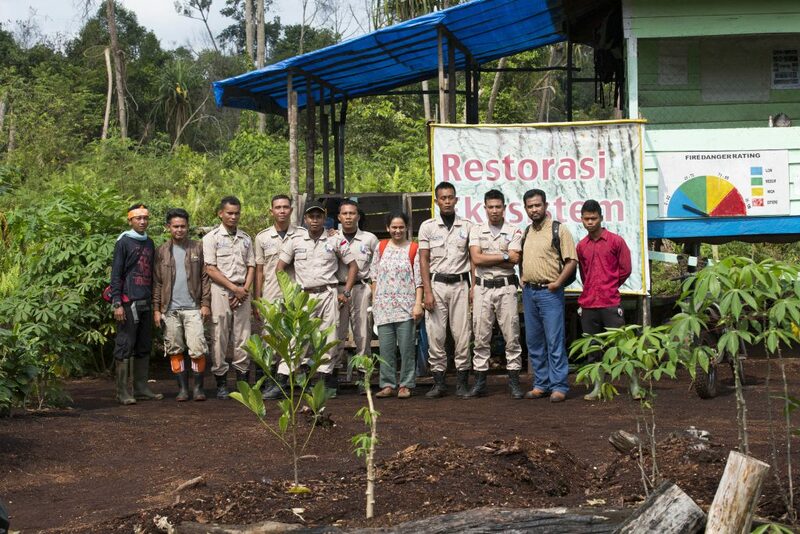 In 2013, APRIL Group established Restorasi Ekosistem Riau (RER), an ecosystem restoration initiative aimed at protecting, restoring and conserving ecologically important peatland forest within Indonesia’s Riau Province. 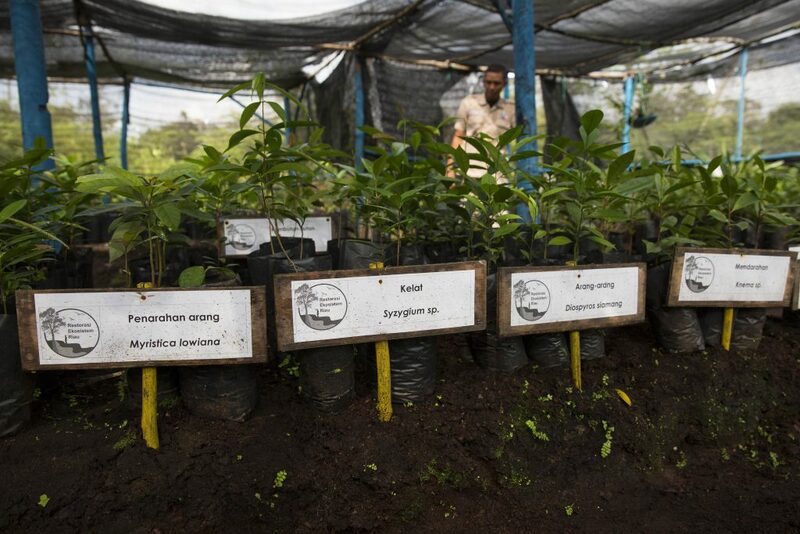 The programme is part of APRIL’s commitment to conserve one hectare for every hectare planted, under 60-year eco-restoration licences granted by the Indonesian Ministry of Environment and Forestry. To date, APRIL has met 83% of its goal with more than 400,000 hectares of forest protected and conserved. In 2015, APRIL pledged USD 100 million for long-term conservation and restoration. .
At its inception four years ago, RER began with protecting and restoring 20,000 hectares of peat forest in the Kampar Peninsula, Riau. At the 2015 COP 21 in Paris, APRIL announced the expansion of RER to 150,000 hectares that includes Padang Island, also in Riau province. Partners Fauna & Flora International (FFI), The Nature Conservancy (TNC) and local social NGO, BIDARA brought their social and scientific expertise to the implementation of the programme, and we continue to work with both these highly respected conservation organisations. The Kampar Peninsula is particularly important as it has been recognized by BirdLife International, the International Union for Conservation of Nature (IUCN), the Wildlife Conservation Society (WCS) and WWF as an Important Bird Area (2004), Key Biodiversity Area (2006), and Tiger Conservation Area (2007), respectively. Further, The Nature Conservancy noted in 2017 that the 344,000 ha block of peat forest in Kampar Peninsula is the largest remaining peat forest in Riau where quality is maintained and is improving and which provides an important link between the remaining blocks of natural forest in Riau and Kerumutan Wildlife Conservation area. APRIL Dialog spoke with Bradford Sanders of RER, about the project, the progress being made and the importance of community involvement. RER talks about ecosystem restoration as a four-stage process. Can you explain more? Protect, assess, restore and manage, in that order. First the landscape needs to be protected from the risks of new encroachment or degradation to enable the next steps to materialize. Next is the assessment of the ecosystem and social environment, which informs stage three, restoration strategy and work on the hydrology, native plant and wildlife species. The final step is the continuous process of managing the landscape to ensure the sustainability of the natural resources within the concession. So what stage are you currently at now with RER? It’s a constant process and not as linear as it might sound. All stages are in progress in different areas of the 150,000 ha. Forest protection is applied across all areas of RER by preventing illegal logging, encroachment and fires. Carbon, community and biodiversity assessments are on-going processes with our partner FFI that has completed three of five concession areas totaling 92,507 hectares. Restoration of hydrology began in 2015 with the closure of several old unmanaged or illegally established canals, and will continue until all canals are dealt with. Conservation Action Plans are being drafted for specific wildlife and plant species, as well as riparian habitats. Management is an ongoing requirement. For example, currently RER is developing Fishing Groups that are monitoring and documenting fish catches, so trends can be analyzed to develop plans for fish population enhancements. The assessment phase is critical in establishing benchmarks. Does this mean that every restoration project is unique? Yes, restoration activities are customized for a particular resource based upon the existing condition and desired future condition. Are there general rules that can be applied to a restoration project? A very important rule is the need for widespread stakeholder involvement from both local communities and scientific experts. Also, in all cases, restoration must be adapted to the specific site and be continuously monitored, assessed and updated based on results. We also need to recognize that restoration takes time and needs significant, long-term and secured financial investments. Results do not come quickly and require consistency in implementation. Is there a known time frame to restore a forest? What are some of the factors that might influence timings? Timeframes vary widely, depending upon the start point and most significantly, of course, the level of degradation. In fact, a tropical rain forest can recover on its own after, for example, a volcanic eruption, in 80-120 years if there is no repeated disturbance occurring. Active restoration can speed up this process and theoretically accelerate timeframes or direct it in a specific pathway. How important is the community to a restoration project? Local community knowledge and acceptance of institutional ‘restoration’ efforts are essential. If not, then new disturbances may occur and delay restoration or recovery efforts. Collaboration between the restoration land manager and community is important to ensure the community will continue to have access to the resources they need from the forest to be utilized sustainably. What are some of the operational challenges in restoring forest on peatland landscapes? There is a long list of challenges. These include remote access, high water levels, heat and humidity, the absence of natural navigational aids due to flat terrain and short sight lines, unstable footing because of exposed roots, and the presence of insects and potentially dangerous wildlife. Then there’s the fact that we are still learning about succession pathways for peat forest ecosystems. For example, if the starting point for recovery and restoration is peatland that has been drained, burned, compacted, and converted to an introduced species, there are currently few documented procedures or timelines for implementing management activities aimed at returning the site to its original species composition, stocking or size distribution of trees and plants. The challenges are many: restoring the water table, controlling the presence of the introduced species, obtaining suitable quantity and quality of planting stock and/or natural seed sources, timing and density of plantings, and the influence of drought and flooding cycles. This is why forest landscape restoration requires multi-stakeholder involvement and support, and for scientific inputs to be accepted and understood. Finally, there’s the danger of repeated disturbances from encroachment or fire that can eliminate years of planting or restoration and tree growth in a single day. What is the most notable accomplishment thus far? Since RER was established in 2013, we have developed forest and fire protection systems as well as worked to develop the trust and co-operation of local fisherman that continue to use the rivers within the RER area. Since 2015, we are happy to report there has been no illegal logging, fires or forest encroachment in RER. This is one of the longest ‘rest periods’ the RER area has experienced since before 2013 and greatly enhances the ability of the forest and wildlife to naturally recover. RER has a total of 64 employees and more than 100 contracted rangers and staff that work to protect and restore the forest every day. Over 80% of RER’s workforce originates from the two regencies in Riau in which RER is located, Pelalawan and Kepulauan Meranti. This demonstrates the commitment of local people to ecosystem restoration and helps RER to establish trust and better understand the needs of forest users. We focus our forest protection efforts on the main access points to the forest and remain in continuous contact with forest users to define and enforce the activities that are legally allowed to occur within the forest. RER balances flora and fauna restoration – which is most important? How do you balance the requirements of each? Flora restoration is the most important, meaning a suitable habitat must be available for an animal species to survive and thrive. When is a forest considered ‘restored’? It’s an ongoing process. Another way of putting this is to liken restoration to ‘recovery’ whereby specific values are returned or recovered to the forest area and which meet human needs. That’s what we’re working to achieve. What is your most memorable moment since working with RER? There have been many, because it is such a pleasure to work with a team that is truly dedicated and motivated to protect and restore the peat forest. One of the most exciting and unexpected events was to learn from our Environment Officers and Rangers that a salt water crocodile lurks in the depths of the Serkap River inside RER. We had heard rumors of this from the local fishermen, but it wasn’t until we placed a camera trap near the river that we were able to document this 4-meter long creature actually existed. Needless to say, our staff no longer swim in the river!